Terminus Audio presents more fresh talent with DIRCRONE, an artist from Germany originally brought to the attention of Jason Mills by Nico Kohler. 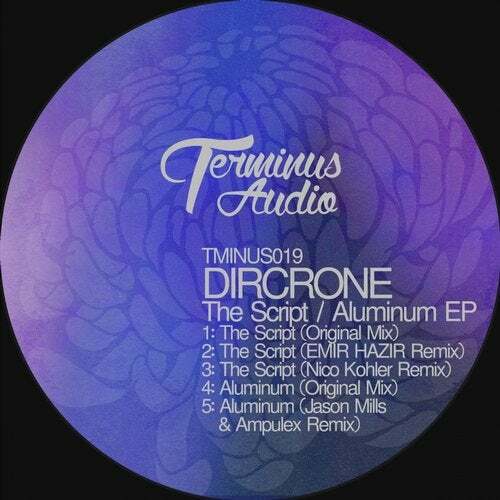 After some time spent in translation and a few remixes later, we proudly present to you an absolutely smashing debut: TMINUS019: DIRCRONE - The Script/Aluminum EP, featuring remixes from Emir Hazir, Nico Kohler, Jason Mills & Ampulex. These tracks are over-the-top and red hot - an exciting standout in a stream of 'plain-vanilla' releases we sometimes see in electronic music. We begin with 'The Script' - the deliberate bassline and wet, slapping drums say it all. This is a massive track filled with futuristic synths, downpitched samples and large cinematic sound design and effects... guaranteed to heat things up on the most poker-faced dance floor. Add this to the essentials crate. Emir Hazir, fresh off his recent 'Algoritma' album delivers a stormer of a remix. Keeping the pressure on with this dark and dialed-in techno approach. If you are a fan of Emir's harder works with tracks such as 'Display' (played by A-Brothers and many more), you will surely enjoy this one. Nico Kohler, a very busy producer in his own right; is next with a stripped back but driving take on 'The Script', featuring a nice punchy kick and cymbal cymbal work along with cool transitional fx in this remix. A great tool for DJ's who prefer a minimal and moody sound, perfect for layering. The second original track on the EP is the crisply produced 'Aluminum', a definite breath of fresh air in a sterile environment. You won't find tracks like this anywhere else. Another fun, yet darkly energetic track filled with trippy vocal effects, slamming synth stabs and a great bass line. A prime example of why Terminus Audio artist DIRCRONE is one to watch in the coming months. Finally, label boss Jason Mills and mainstay Ampulex form a deadly duo and turn things up a notch with a calculated weapon intended to cause a stir at peak time. Big bass, running 16th note hi hats and an intense vocal break ensure that this one you want to take notice of - use at your own discretion. TMINUS019 is a definite statement made by the debuting German artist DIRCRONE - we look forward to hearing more.